Bouquets are so boring - especially compared to puppies, and a good cause. 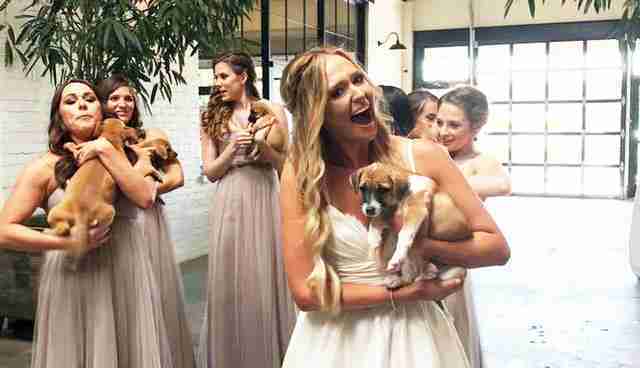 During a bridal party photoshoot ahead of her recent wedding, Callie Riggs's big day was made even better. 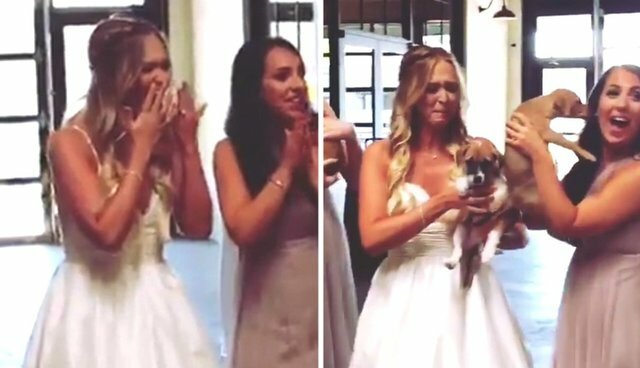 She had no idea that her fiancé, Jeff, had invited a few fluffy surprise guests from a local animal rescue group to fill in for the flowers Riggs was thinking they'd be holding instead. The adorable young dogs were all brought in from Bosley's Place Inc., an Atlanta-based nonprofit that specializes in rescuing orphaned puppies who require more care than most shelters can provide. In order to help raise donations, and to find willing adopters, the group encourages little meet-and-greets like this one. Of course, Riggs didn't seem too upset about being upstaged. "She loved it!" Bosley's Place founder Jennifer Siegel told The Dodo. "And the puppies are starting to get the publicity they need to move on to the next phase of their lives." The attention generated by these adoptable puppies will go along way to making their lives better. In fact, three of the dogs from the wedding shoot have already found forever homes of their own. Indeed, that's what Bosley's Place is all about. "All of the babies we rescue are orphaned and most have terrible starts in life, but they all get very happy endings," Siegel said. "We make sure they get the absolute best forever homes possible." Click here to learn more about Bosley's Place Inc., and to find how you can help.